I don’t pretend to know a lot about drinking. Or anything about hangovers. But I do know breakfast sandwiches. Whip up these satisfying egg sandwiches the morning after a late night out with friends to rid yourself of those hangover blues. 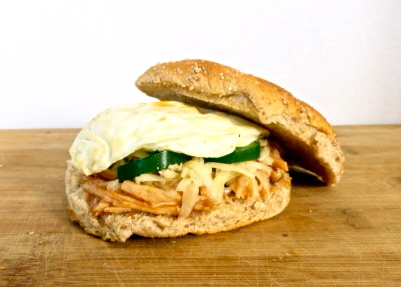 This sandwich is hearty and spicy, what cowboys would eat if they had too much moonshine. Or what college kids eat after they drink too much Keystone Light. 2. Butter a small pan and heat over medium heat. 3. Pour the egg into the pan and scramble the egg for 3-5 minutes or until egg is no longer runny. 4. On a warm bun, layer cheese, BBQ meat and jalapeno. Top with the scrambled egg and enjoy! The best parts of a free hotel breakfast—in sandwich form! Germ infested comforter not included. 1. Butter a nonstick skillet and heat over medium heat. 2. In a small bowl, whisk together eggs, milk, salt and pepper. 3. Pour eggs into preheated skillet and cook until edges begin to set. Push cooked eggs towards the center of the pan and allow uncooked eggs to run to the edges. Repeat until eggs are nearly set and then remove pan from heat. 4. 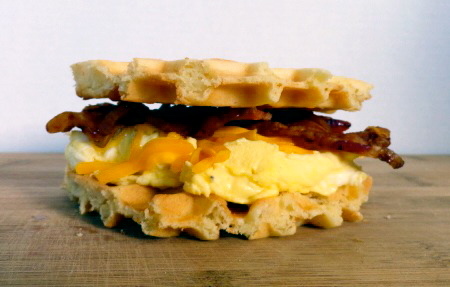 Layer eggs, cheese and bacon onto one waffle. Top with remaining waffle. 5. Drizzle maple syrup over the top. 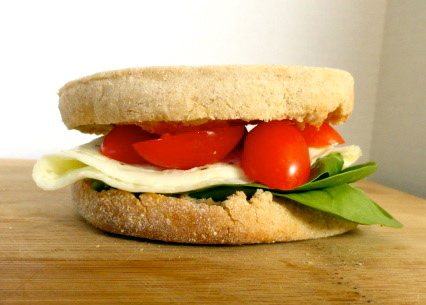 After a night of heavy drinking, this sandwich is perfect to start off a day of light eating. 1. Spray a small pan with non-fat cooking spray and heat over medium heat. 2. Pour egg white into heated skillet and sprinkle with salt and pepper. 3. Cook until set, about 4 minutes. Fold into quarters. 4. Place egg white on one half of the toasted muffin. Top with tomato, spinach and remaining half of muffin. 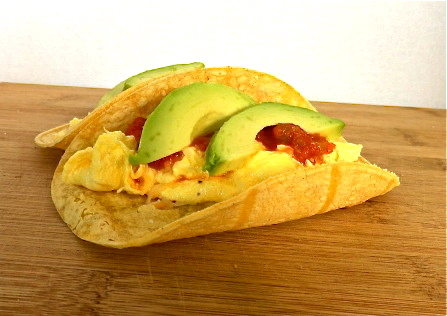 Tacos for breakfast – muy bien! 2. In a bowl whisk together eggs, milk, salt and pepper. 3. Pour eggs into preheated pan and allow to cook until edges begin to set. Push cooked eggs towards the center of the pan and allow uncooked eggs to run to the edges. Repeat until eggs are nearly set and remove pan from heat. 4. Divide eggs among each tortilla. Top with cheese, salsa and avocado slices.